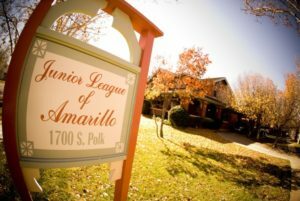 Martha Shelton Houghton (1893-1983) paid the highest tribute to the Junior League of Amarillo by donating her home in 1965 to be used as a headquarters. Although Mrs. Houghton was never a member of the Junior League, she was the first honorary member. Shelton-Houghton House remains today as a living testimony to the pioneer spirit of the early settlers of the Texas Panhandle. Mrs. Houghton was the only daughter of rancher John Malcolm Shelton and Flora Exum Shelton. John Shelton moved to Texas in 1889, settling in Wheeler County. He eventually controlled ranching land extending west to the New Mexico border and north to the northern border of Texas. 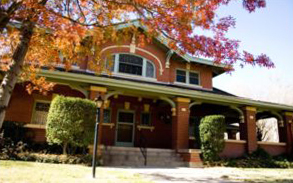 In 1912, Shelton purchased a lot in the Plemons addition of Amarillo at 1700 Polk, one of the most fashionable neighborhoods. He commissioned a young architect, Joseph Camp Berry, to design his home. The house that Berry designed for the Shelton family was constructed in an eclectic prairie style – “prairie” as in such details as the massive roof, which contributes to the general low, horizontal appearance, and “eclectic” in that it borrows from other architectural styles, such as the classical porch that wraps around the house and the “porte-cochere” on the north side. The design included a living room with a grand staircase, a formal dining room, a music room, an upstairs parlor, several bedrooms, and a half basement. Built by W. M. Rice, the house was completed and occupied by the Shelton family in 1914. It was during this time that Martha, scarcely twenty years old, returned from school in Virginia, and assumed the task of choosing furnishings for the new home. Her selections included English mahogany paneling, maple floors, and fixtures from such exotic places as Kansas City and Chicago, hand- painted wallpaper, and numerous Oriental rugs. In 1923, upon the death of her father, ownership of the house passed to Martha and her husband, Ted Houghton, well known Panhandle cattleman. Changes made through the years by Mrs. Houghton included adding two rooms and a bath, covering the maple floors with oak, painting the paneling in the dining room and upstairs, and modernizing the kitchen. When Ted Houghton died in 1956, Martha began to spend most of her time at the family ranch in Channing. And so, in 1965, upon the urging of her daughter and League member, Martha Houghton Garner, Mrs. Houghton donated Shelton-Houghton House to the Junior League. The home has remained very much as it was when occupied by the original owners. In most instances, only the functions and furnishings of various rooms differ from the original. In 1981, after lengthy application and diligent work by the League, Shelton-Houghton House received both Texas Marker and National Register plaques, identifying the structure as an official historical landmark. The League is the beneficiary of the kindness and benevolence of strong, Panhandle families whose names will forever identify an outstanding historical landmark.